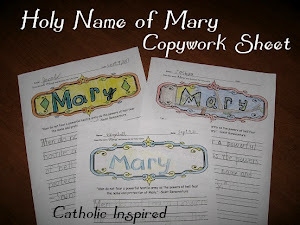 The feast of Mary's Holy Name is Sept. 12th. 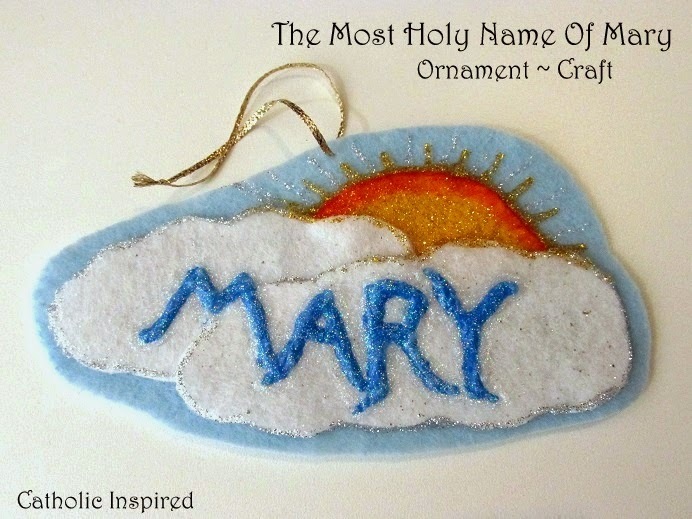 There is great power behind Mary's name! Read about this devotion HERE. Elizabeth and I were trying to make this ornament look kind-of heavenly. So we have two sparkly clouds and a sparkly sun. 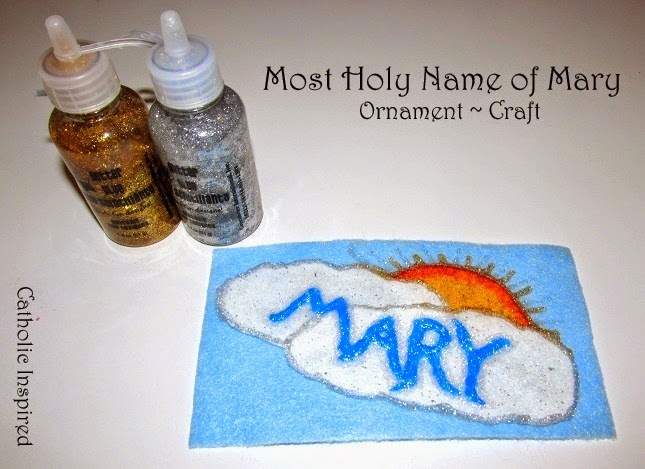 Plus, we have sparkles all over Mary's name which is written in the clouds. 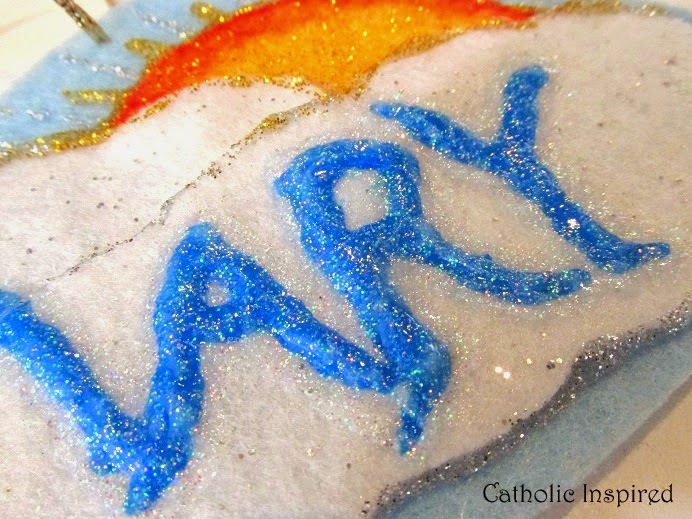 We used white felt with sparkles, yellow felt, and light blue felt. We cut out two cloud shapes from the sparkly white felt, a half circle from the yellow, and a rectangle which is big enough to fit the clouds and sun on. We outlined the yellow with an orange permanent marker and we added gold glitter glue to it. 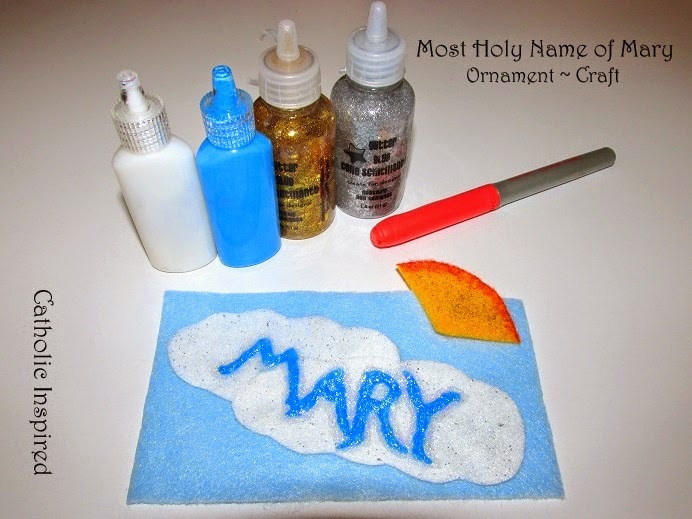 We glued the two clouds together and used blue fabric paint to write Mary's name on the clouds. Once that dried we covered it with clear-sparkle fabric paint. After that was dry we glued all the parts onto the blue rectangle. Next we added silver glitter glue around the edge of the clouds. And we added gold glitter glue around the sun. We also created rays coming from the sun. Once it was all dry we cut out around the clouds and sun. These pictures don't do this justice. It's just full of sparkle! Most Holy Mary, Queen above, Pray for us! May every evil flea whenever we whisper the Holy Name of Mary! We have lots of activities posted from the past few years. Click here to see more ideas.